“There is no substitute for cubic inches” is a slogan often heard. Taking the trend of downsizing in mind, the engine upgrade in the D8 GTO from a 1.8-liter 20V to a 20V 2.5-litre five-cylinder seems like a remarkable step. But is it really? The first successful use of the ancestor of the 2,5 litre engine, which is currently used in the GTO, the 2.5 TFSI, was during a touring car championship in California on September the 17th 1989. 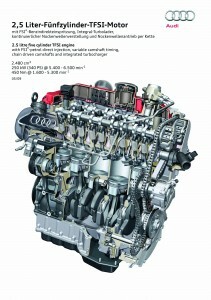 Quattro GmbH developed the engine. 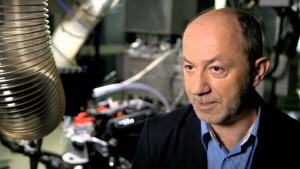 Head of Powertrain Development, Michael Ganz was the engineer responsible for the project. Driver and German racing legend Hans-Joachim Stuck, fought the battle on the racing track with his “only” 2,480 cc measuring 5-cylinder against mostly V8 engines with more displacement and won the race. An extremely remarkable achievement. The 2.5 litre at that time was in fact already a downsized engine. Engine wizard Michael Ganz was able to realise over 700 hp from the five-cylinder, which in addition proved to be extremely reliable. The V8 engines had more torque and a higher top speed, but at the first braking point there was the benefit of the “Leichtbau” five-cylinder. Braking could be done much later than the V8-powered competition and tire wear was also significantly less. Hans-Joachim Stuck is still more than lyrical about the 5-cylinder, when he thinks back to that time. The first derivative units found their way to consumers in the subsequent model year 1990. Other brands had smooth 5-cylinders in their delivery range. The five-cylinder engine combines the low fuel consumption of a four-cylinder with the beautiful smooth running of a six-cylinder. Both Ford and Volvo also took advantage of great five-cylinder blocks respectively in the Ford Focus ST and RS, Volvo C30, S60-R and 850. 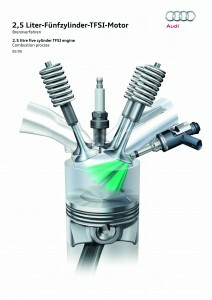 Quattro GmbH has been polishing the five-cylinder the past years in such a way that it has become a dangerous weapon. 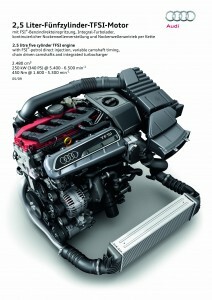 It is currently the most compact and powerful engine in the world. If you watch video interviews of the spiritual father of this beautiful engine, Michael Ganz, you can see some analogies with Joop Donkervoort. Somewhat introvert, but very competitive. Both go to extremes. That is clear. In the class of 2.0 – 2.5 litres, the 2.5 litre TFSI already won the prestigious “Engine of the Year Award” for the fourth time in a row. 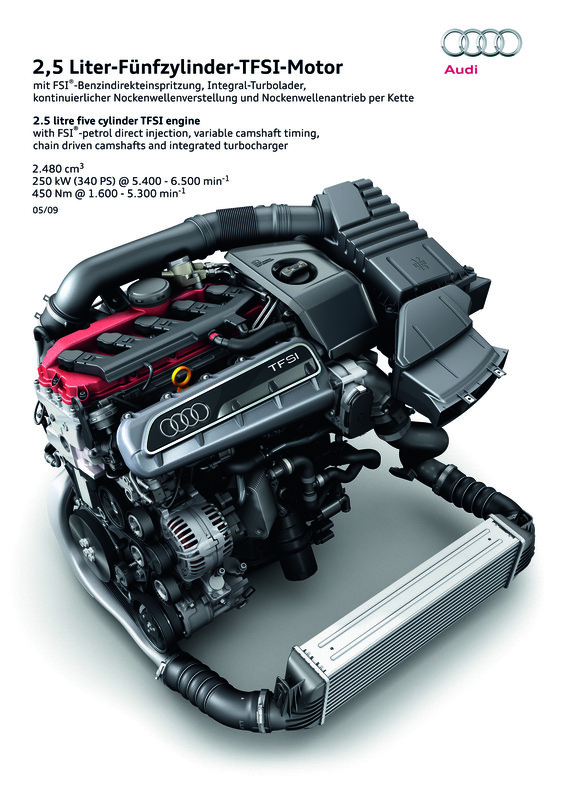 The engine which now can be found in the Audi TTRS, RS3 and Q3RS. Gary Tsang, Engine of the Year Award judge on behalf of China, is sharing the opinion that this engine will go down in history as “one of the best five-cylinder engines in the era of the internal combustion engine.” Quite an achievement. Torque, power and a great sound; this block is a wonderful cocktail. It is a remarkable fact that the large number of engines in the top five of this award class are diesel engines. In addition to the beautiful sound, the engine has the torque of a diesel engine. The 2,480 cc displacement of the powerhouse has a whopping torque of 450 Nm between 1,600 and 5,000 rpm. That compares to a Audi TDI diesel unit with direct injection of the same brand. Equally impressive is the relatively low fuel consumption and CO2 emissions in relation to the rousing performance. The engine is even more economical than the 1.8 20V Turbo from the previous D8. The 2.5 TFSI uses the latest techniques and thus makes the Audi Marketing phrase “Vorsprung durch Technik” a claim with substantial body. Direct fuel injection, variable intake and exhaust camshafts provide a broad powerband and relatively low fuel consumption. The cylinder block is made from a special and high-strength cast material. This is necessary because the crankshaft and main bearings are more narrow than normally is the case due to the relatively limited length of the block. That gives additional stiffness to the block. Great also for a Donkervoort with only three mounting points for the drive unit. In contrast to the 1,8T, the 2,5 is equipped with a steel engine oil sump. Basically the same in construction as the Ford engines. A comforting thought for the unfortunate “oil sump-splitter drivers” among us. The crankshaft is fitted with six small main bearings and silicone filled viscous damper to eliminate vibrations. Special pistons with a high degree of thermal resistance and low weight are beautifully designed. 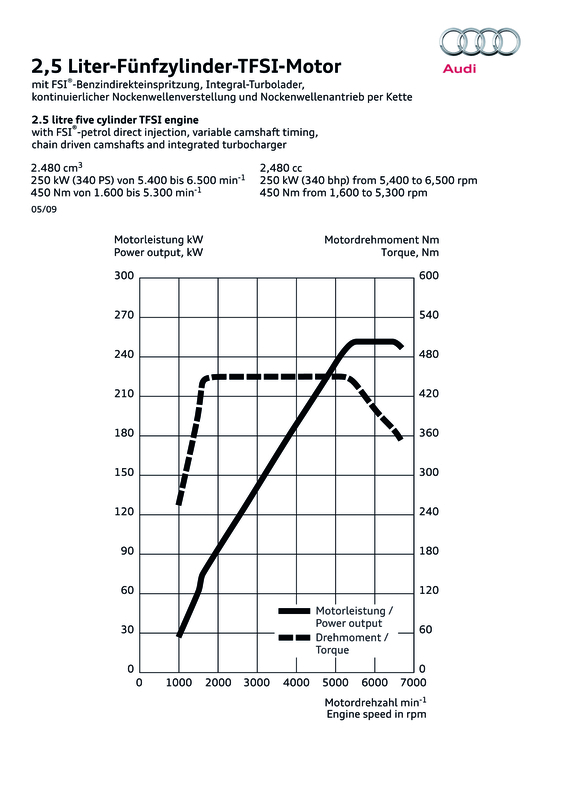 Minimum friction, and very limited oil consumption are the result, compared to the 1,8T. 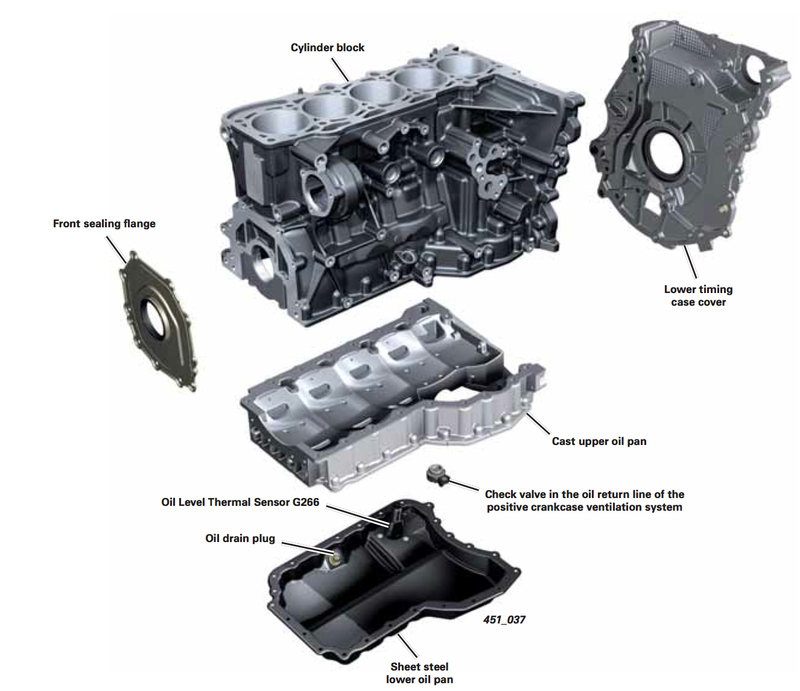 The aluminium cylinder head is originally from a VW 5-cylinder engine, but has been modified for the higher peak pressures of this turbo-block. The modifications include a different aluminium composite, better cooling of the spark plugs, modified valve seats, sodium-filled valves, an auxiliary inlet port for the required flow in the combustion chamber and installation of a high-pressure fuel pump. Creating less worries is the lack of a timing belt. There are two timing chains with pressurized chain tensioners mounted on the timing side. Easy to maintain when compared to the 1,8T 20V. 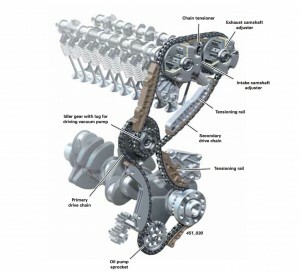 The short chain coming from the crankshaft drives the oil pump and the vacuum pump. The camshaft adjusting system is operated through an auxiliary gear. The lubrication system has been designed in such a way that despite violent movement of direction, there is always sufficient oil pressure without air bubbles. The block is equipped with PCV (Positive Crankcase Ventilation). This system ensures that during the combustion process oil and water vapor can be efficiently separated. This realises a longer life of the engine oil. The block is equipped with an electrically operated after run cooling down pump. If you turn off the engine, the pump runs for a while. The cooling system keeps the turbo cool until it reaches a safe value. Ideal! The mounted Borg Warner K16 turbocharger has a diameter of 64mm and a capacity of up to 7 litres of air per second at full load. The boost pressure is approximately 1.2 bar. The system also has a thermal protection by means of a sensor with an exhaust gas temperature with a limit of 980 degrees Celsius. The injection is operated with direct fuel injection, which benefits the efficiency. Such a system operates with tremendous pressure. As many as 120 bar. The opening pressure of the injectors is even higher; 145 bar! In order to be able to measure the correct fuel pressure, there are to low and high pressure side mounted sensors. The Bosch MED 9.1.2. Engine management system calculates the load on the basis of a MAP sensor (Manifold Absolute Pressure Sensor) and a sensor for the engine speed. 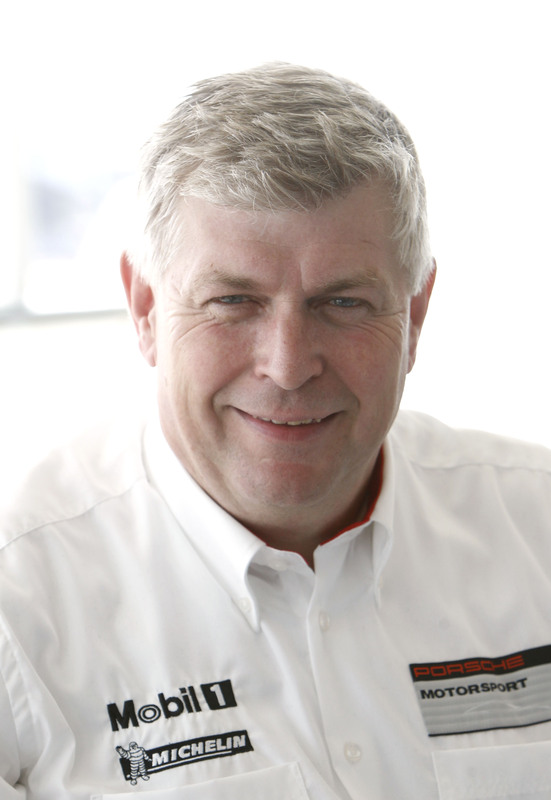 The main responsible person for the utilisation of the 2.5-liter TFSI in the GTO is Wolfgang Hatz. It all started with an obligatory visit to Audi discussing further cooperation around engines. Wolfgang Hatz, now in the Vorstand at Porsche and at that time responsible for the development at Audi. Joop was proud to visit Audi with his beloved GT. Mr. Hatz made the suggestion to Joop that he still could utilise a more sporty engine in the GT. Then you could have a proper fast car. The sound track alone made Joop feeling like he was in heaven. This was, after a ride in a prototype TTRS with a hand-built engine, the beginning of many a sleepless nights for Joop. Because the GT is indeed a top car, but the chassis was not spacious enough for this once in a lifetime “engine opportunity”. Denis and Joop were invited during the annual Autovisie super car test (Dutch Magazine) to drive with the production version of this engine on the race track. Including the lighter 1.4 with turbo and compressor and the 2.0 TFSI as possible alternatives. The engine-dimensions of the 2.5 litre are in fact the basis for the development of the GTO. What followed was a long process with all kinds of people involved in a project to find the right conditionality’s. The first test engine which was delivered to Donkervoort was, according to Denis, a used engine which had been tested to the extreme on the “Prüfstand” at Audi. Again this was a hand-built version. And what to do when you are called Donkervoort; loose some more weight! Subsequently, the block was stripped down, air pump, large dynamo, the oversized oil filter and the heavy dual-mass flywheel of the TTRS. That standard dual-mass flywheel eliminates vibrations of the block wonderfully, but the additional weight slows down acceleration times. As a result of the extra length of the five-cylinder engine, the ideal weight balance in the GTO became endangered. This is solved by the self-fabricated shorter aluminium clutch bell housing between the engine and gearbox. Quite a challenge, because one of the wishes for the GTO was a hydraulic clutch. Less available space in the clutch bell housing and still manage to squeeze in a hydraulic slave cylinder. Pfjoeh. 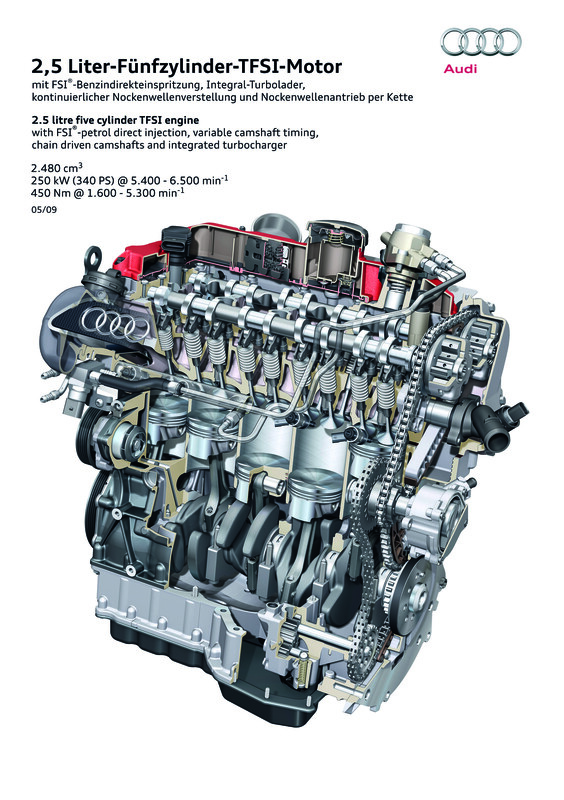 Auto-CAD designed engine mounts, at a position other than the standard transverse mounted engine, first also had to be approved by Audi. A heavy topic for Donkervoort was the air filter design. Limited turbo lag can be achieved by making the airflow as optimal as possible. Several factors are of importance. The shorter and more optimal the air filter and air intake design is, the better the engine is “breathing”. We have chosen an airbox construction made out of carbon, mounted just before the engine. An ideal position close to the intercooler. The turbo lag has been eliminated almost completely and the international press has been full of praise. A big advantage is that the so-called LMM (Air Mass Meter) is missing in the air intake system of the GTO. 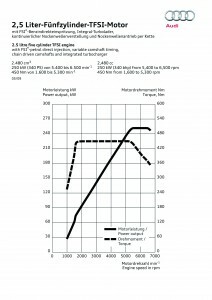 A LMM is measuring the amount of air sucked into the air intake system. Via the LMM the electronic control unit (ECU) knows that more fuel must be injected. The absence of the LMM in the GTO, ensures faster throttle response, a lesser sensitivity and a more optimal air inlet channel without any kind of disturbance. Donkervoort is extremely proud of its own development of the air intake manifold. This is fully self-developed in house and constructed out of cast aluminium, and surprised even the engineers of Audi in Neckarsulm on the power bench. The flow was so much better than their own solution, which caused a little dent in the German ego. The Donkervoort solution is now mounted as standard in the factory race version of the TTRS. This made Donkervoort proud. The standard engine management software of the 2.5 TFSI was, of course, based on the TTRS, with excessive weight relative to the GTO of about 750 Kg. So the developers of Audi’s main supplier Bosch were underway to adapt the engine to the vehicle weight and the specific needs of Donkervoort. Yet a different route than in that time with the 1,8T 20V, where many of the modifications were done in the Netherlands with a more limited budget. In itself a nice welcome change for the Bosch engineers instead of another standard Audi development. The passion and tremendous enthusiasm for the GTO project from the Bosch experts helped Donkervoort a great deal. Nothing was too crazy in the support around the project. For the first time Donkervoort also needed to fabricate the connecting cables. The harness -with super reliable CAN data bus technique- is included with every engine that is shipped to the Donkervoort warehouse. The first step was bringing the engine to life in the test chassis. Next, a project of 2-3 months was planned with Bosch in order to achieve the required sophistication of the engine control software. In addition things like cold start simulation, eliminating vibrations, “Laufkultur” of the engine, emission requirements and homologation had to be resolved. Ultimately, this process took longer than scheduled. After all, quality takes time. The gray “0-car” has been a guest at the Bosch test track in Boxberg for a long time. Now the GTO was ready for his final exam; homologation tests at the Circuit of Nardo in Italy. The D8 had no oil thermostat. That was not necessary, with an engine oil sump capacity of less than four litres. The 2.5-liter has a nice 7 + litres to warm up in its crankcase. Substantially equal to the almost 8 litres of a D8 with a dry sump system. The oversized situation, especially in combination with the external oil cooler, caused that in many situations the engine oil temperature remained to cold. Donkervoort therefore assembled for the first time in its history an oil thermostat on the GTO, so that the oil which float reaches operating temperature earlier. The standard Audi TTRS G6 fuel pump from Hitachi which is applied and adopted by Donkervoort has something unique. The pump has its own ECU (Electronic Control Unit). The pump is for the first time integrated into the aluminium tank of the GTO. The beauty of an ECU that allows you to completely adjust the fuel supply. But yes, you have a set of parameters there again. Denis drove with the Bosch engineers with the laptop on their lap during testing where even the smallest imperceptible hick-up could be programmed out. The GTO is thus provided with a fuel system, which is adaptive under all conditions. Great! 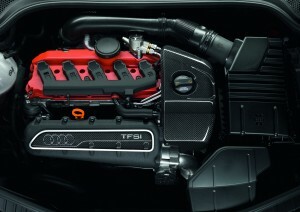 An interesting fact is that the 2.5 TFSI engine for the GTO are hand-built in Germany. The required precision and optimize the interaction between the different components like pistons etc. is thus guaranteed. After all, the standard mass-production comes from Györ, Hungary. Nothing wrong with that, but a hand-built and blue printed engine is the ultimate technical “Leckerbisschen”. Simply more sophisticated. Denis and myself share the opinion that the chassis of the GTO can handle a lot more power than the current 400 hp. That would make the GTO a bit more naughty. 50-100 Hp extra is something which could curl the mouth corners of Denis. The limiting factor is that such a homologation process must be repeated again. And the current turbo with integrated pre-catalyst, is the limiting factor in terms of thermal load in relation to the reliability. The GTO is a balanced whole. A nice safe mix between power and controllable mechanical grip. But yes, if you are called Donkervoort, you have a pre-determined gene in you and you want to continue to set the bar higher and higher. A nice drive for innovation. Indeed, there should always be something to be desired and you should continue to dream is it not? And it is evident that there will be a closed version of the GTO, so in fact the new GT in the future. We will be attending races again. We will await all off that with appropriate tension and curiosity….